APR-246, also known as PRIMA-1MET, is a small organic molecule that has been shown to restore tumour-suppressor function primarily to mutant p53 and also to induce cell death in various cancer types. APR-246 (PRIMA-1MET) is the first clinical-stage compound that reactivates mutant p53 and induces apoptosis. 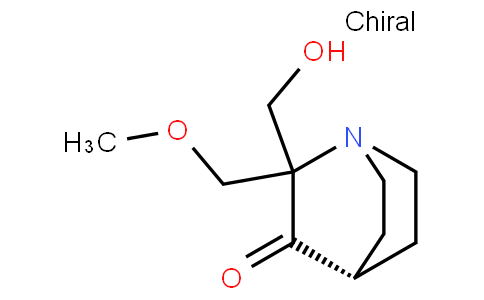 APR-246 is a prodrug that is converted to the active compound methylene quinuclidinone (MQ), a Michael acceptor that binds to cysteine residues in mutant p53 and restores its wild-type conformation. APR-246 completely restores the cisplatin and doxorubicin sensitivity to p53-mutant drug-resistant ovarian cancer cells. It not only reactivates p53 but also decreases intracellular glutathione levels in a dose-dependent manner. APR-246 can trigger apoptosis in a p53-independent manner by inducing ROS and endoplasmic reticulum (ER) stress and by inhibiting thioredoxin reductase 1 (TrxR1). It was also reported that APR-246 induces cell death in myeloma cells independently of p53 status by impairing the GSH/ROS balance. PRIMA-1Met/APR-246 efficiently inhibited the growth of the SCLC cell lines expressing mutant p53 in vitro and induced apoptosis, associated with increased fraction of cells with fragmented DNA, caspase-3 activation, PARP cleavage, Bax and Noxa upregulation and Bcl-2 downregulation in the cells.